Home > Draper Natural History Museum > “Home, Sweet Home” for our new flock! “Home, Sweet Home” for our new flock! 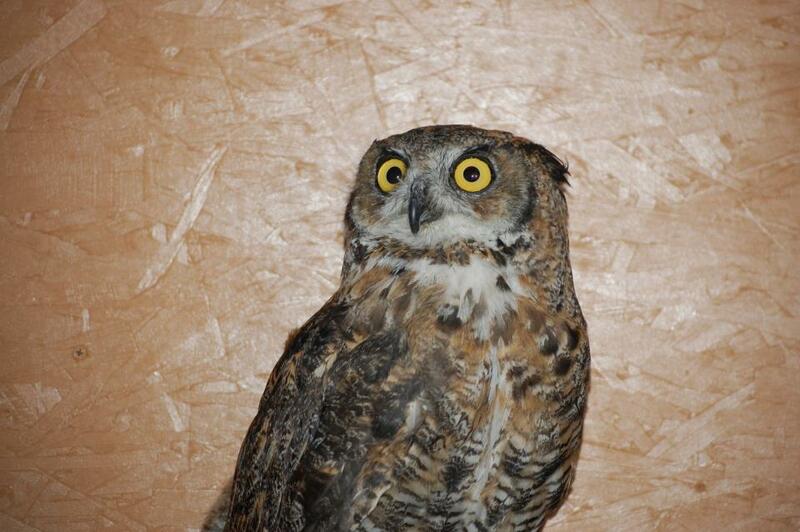 Great horned owl Teasdale shortly after arriving at his new home with the Draper Museum Raptor Experience. I realize it’s been a while since we here at the fledgling Draper Museum Raptor Experience posted anything new, but there’s been good reason! The last couple weeks have suddenly been a wave of activity here. Our permits all finally came through and I began scrambling to make arrangements to get our birds here. It was short notice for a lot of folks, but I’m happy to report that three of our four birds are finally home! On Friday, I drove to Evanston, Wyoming, to meet the wonderful folks at Second Chance Wildlife Rehabilitation who have been caring for our great horned owl. After six-and-a-half hours in the car with my dog (I left too early and would be back too late to leave him inside all day or to get him to day care) I met Debbie. After a short talk about birds, permits, and various other things, we transferred the owl into my travel box and Tucker (my dog) and I headed back to Cody. We arrived home before dark which was nice because it allowed me to watch him as he settled in to his new surroundings. Everyone at the Center is so excited to finally have birds here!